The National Thoroughbred Racing Association (NTRA) announced today that Kendall-Jackson Winery, Besilu Stables, N.O.A. Watches, FLAIR® Equine Nasal Strips, Adequan ® and Racetrack Television Network (RTN) have reached agreements to serve as Official Partners of The Eclipse Awards Presented by Daily Racing Form, The Stronach Group and Breeders’ Cup. The 42nd annual Eclipse Awards ceremony will be held Saturday, January 19, at Gulfstream Park in Hallandale Beach, Fla.
Kendall-Jackson Winery was founded in 1982 and is committed to making wines from only the best quality grapes. Today, the winery is committed to producing the highest quality wines. Through responsible land management, sustainable practices and artisan winemaking techniques, Kendall-Jackson is committed to quality in all things. Benjamin Leon Jr., the President of Besilu Stables, spent 30 years breeding and showing Paso Fino horses before purchasing his first Thoroughbred in 2009. He owns a 650-acre farm in Ocala and is the owner of two-time Breeders’ Cup Ladies’ Classic winner Royal Delta, who was purchased for $8.5 million in 2011. Besilu Stables is also the presenting sponsor of the Florida Derby and Fountain of Youth Stakes. N.O.A. Watches is a completely independent family business based in Balema, Switzerland. N.O.A. is rapidly achieving worldwide recognition as a leading name in luxury timepieces. N.O.A. watches, which are available at Time Concepts in The Village at Gulfstream Park, will be presented to both the jockey and trainer of the 2012 Horse of the Year. FLAIR® Strips provide drug‐free support and protection to the respiratory system of the hard‐working equine athlete. FLAIR Strips are proven to: reduce airway resistance, reduce lung stress and bleeding, reduce fatigue, and shorten post‐exercise recovery time. Luitpold Animal Health, based in Shirley, N.Y., markets Adequan® i.m. and Adequan® i.a. for horses. The company is committed to advancing the cause of equine health. Adequan® i.m. (polysulfated glycosaminoglycan) is the only FDA-approved treatment for degenerative joint disease (DJD) clinically proven to relieve the pain and symptoms of osteoarthritis and stimulate the natural “wear and repair” cycle within the joint. This injectible treatment works by blocking the damaging enzymes as they form, relieving pain of inflammation, improving lubrication in the joints, and inhibiting degeneration before cartilage damage can continue. For more information about products from Luitpold Animal Health, visit www.adequan.com or call 1-800-458-0163. Adequan® is a registered trademark of Luitpold Pharmaceuticals, Inc. The Racetrack Television Network (“RTN”) is an 80-channel subscription package that caters to horsemen, bettors and racing fans worldwide by delivering every simulcast from North American and select international tracks to televisions, computers, and mobile devices (including iPhones, iPads, Android phones and Android tablets). The television package is available via satellite provider DISH Network, while the online and mobile packages are available directly from RTN at www.rtn.tv. RTN features access to the actual track simulcast feed, unedited and uninterrupted, with a dedicated channel assigned to each track simulcast. RTN’s online and mobile offerings feature live video streaming, a full library of race replays, and all necessary Equibase data. RTN offers the largest simulcast menu in the pari-mutuel industry-either commercially or residentially. 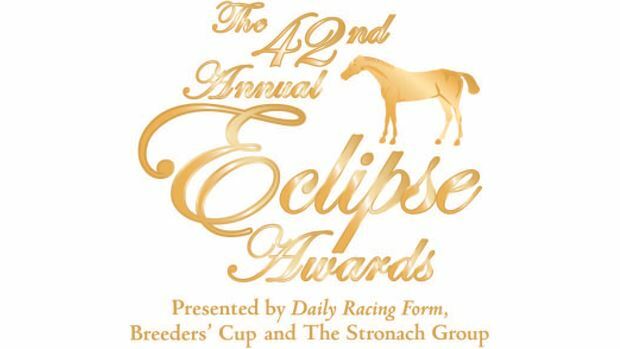 The Eclipse Awards, which will be televised live on HRTV, are presented by Daily Racing Form, The Stronach Group and Breeders’ Cup and produced by the National Thoroughbred Racing Association (NTRA). Official Partners of the Eclipse Awards include Adequan, Besilu Stables, FLAIR® Equine Nasal Strips, Keeneland, Kendall-Jackson, N.O.A. Watches and Racetrack Television Network. The official hotel of the Eclipse Awards is the Westin Diplomat Resort and Spa.